You’re probably here because you want to learn to fly as a beginner, or simply practice flying radio controlled planes and hone your skills more. If any of those match you, this is the right place. 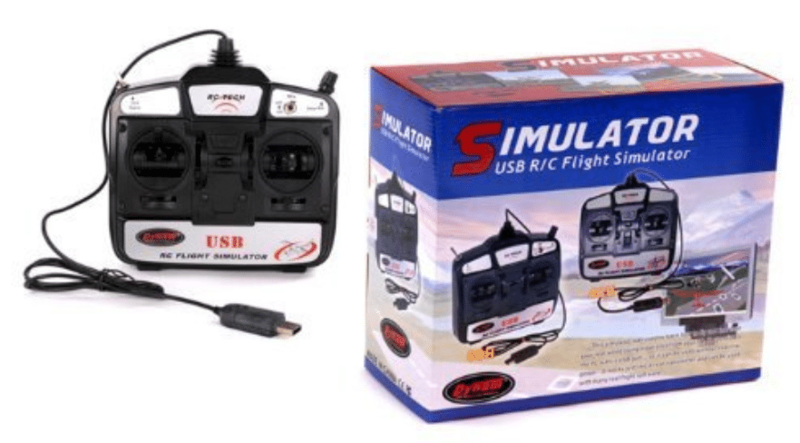 This guide will show you EXACTLY what the Best RC Flight Simulators are, for whichever skill level you are at right now. You and I both know flying remote control planes is quite fun, or at the very least if you haven’t yet… it looks fun. Well, it’s great until it crashes and you either have an expensive fix on your hands, or you need to buy a completely new one. Flight simulators – FIX it for good! – Willing to learn like the Pro’s? – Want to save a LOT of money long term? If you answered YES to any of those, keep on reading. With a good software, you can pick planes, helicopters, drones, blimps and many other oddly strange remote controlled objects. There’s a list below, showing you a narrowed down chart of just 5 RC flight simulators. You’ll see “Best of the Best” and “Best Value” and which categories the top picks for going all out and spending the most on a software. Lastly, we’ll show you how to be reasonable while finding the “middle point” for cost and features. Afterwards, keep on reading to see the detailed RC Flight Sim Reviews (with pro’s, con’s and bottom line). Below I managed to review 5 of today’s highest rated RC flight sims on the market, GreatPlanes as always takes the win. The #1 pick is there for a REASON, check it out! 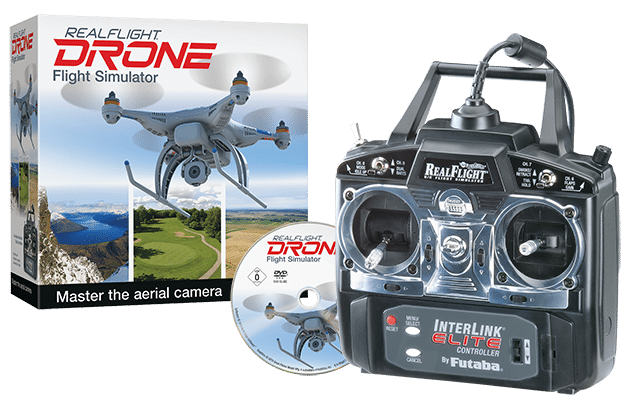 When it comes to picking the best simulator for learning to fly rc helicopters, drones, planes, and similar crafts, using the latest and greatest software from Great Planes is the way to go. I’d like to introduce you to the Great Planes ReadFlight RF-8 radio simulator. This simulator software is packed with an Interlink-X Transmitter Mode 2. This is everything you need to start practicing on a Windows computer. Unlike its predecessors, this software lets you take the “Real” into another level. Although the main features are covered below, I must mention that it Is compatible with virtual reality headsets. In particular, it can even work with the high end models made by Oculas. Right below, I’ll cover this sim’s main features. Real Flight has always been focusing on having really impressive graphics, as really the secondary way of giving you a very real experience flying. 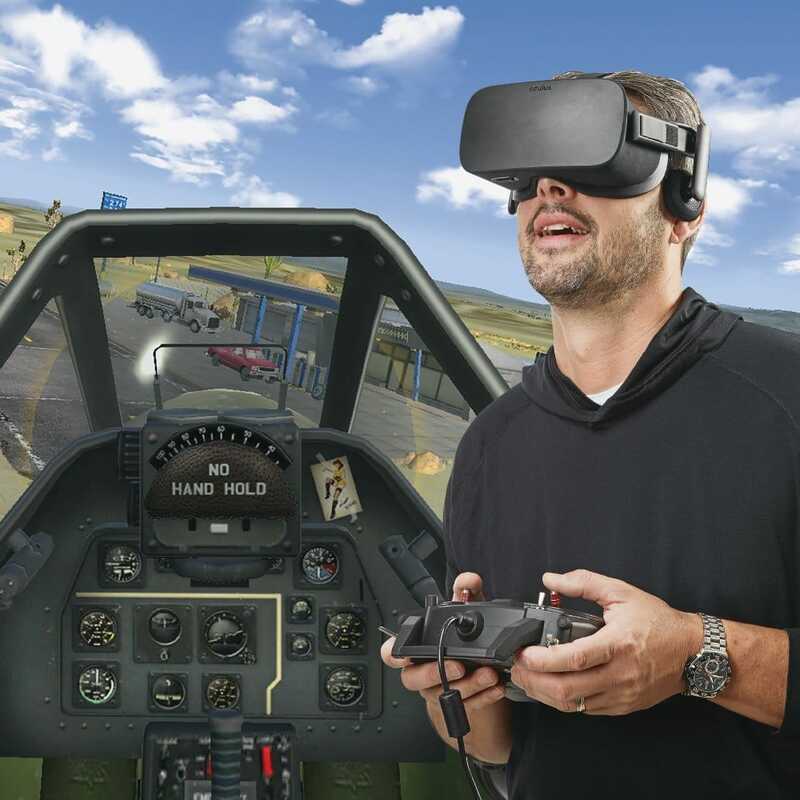 The version of this RealFlight rc simulator, is no exception. It requires some high-end computer power, so don’t expect a little laptop will handle this smoothly. The software is rather easy to use if you’re just getting started. With the intuitive interface, there’s little to no learning curve. Real Flight has always been focusing on having really impressive graphics, as really the secondary way of giving you a very real experience flying. 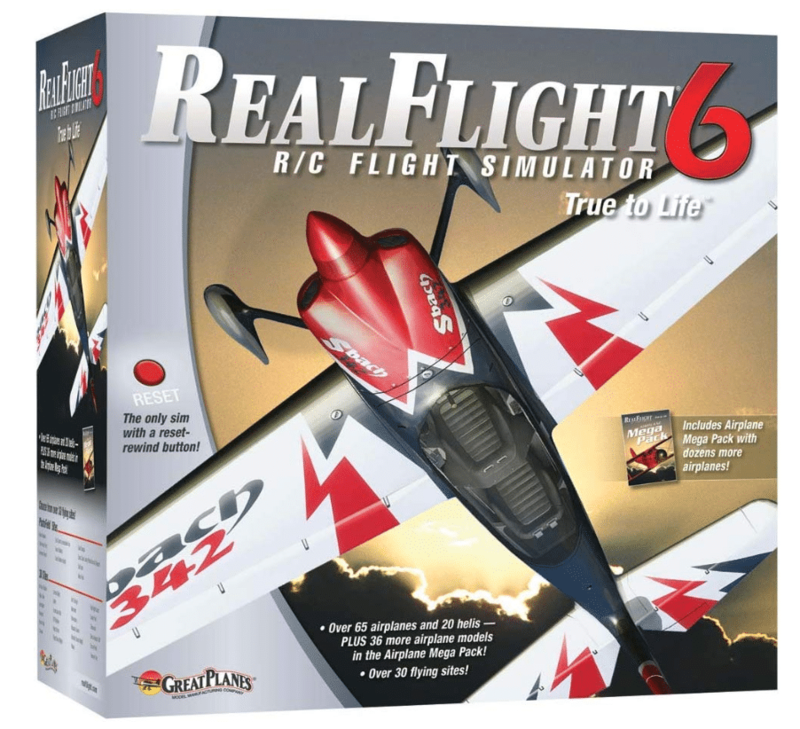 The version of this RealFlight rc simulator, is no exception. It requires some high-end computer power, so don’t expect a little laptop will handle this smoothly. At the price point this software is in, there’s a lot to choose from. When you are finished downloading, you’ll have access to more than 140 aircrafts (drones, planes, helicopters, etc..) and a whopping 40 sites to fly in! As mentioned earlier, it’s VR ready. The days of just using the computer screen is over. By wearing a virtual reality headset, you’ll experience “like actually being there” feeling and sensation. When it comes time to actually flying the real thing, there will be little difference from using the software. The software is rather easy to use if you’re just getting started. With the intuitive interface, there’s little to no learning curve. -Minimum system requirements of 1.0GHz CPU or greater, 512MB of RAM or greater, 10 GB HD of space or more, DVD Drive, 32 MB Dedicated Video Memory or more. -Optimal system requirements of 2.4GHz Dual Core or greater, 2 GB of RAM or greater, 10 GB HD of space or more, DVD Drive, 512 MB dedicated video memory or more. If the term “plug and play” has any significance to you, than this software is for you. I love that it’s easy to use, and has a high quality transmitter that has a wide range of functions. It’s pretty affordable, considering you are getting a high quality software with a ton of features. In addition, you’re getting everything you need with the most advanced dynamics and graphics to learn how to fly. One of the few softwares that is compatible with virtual reality… this one is big, especially if you have a powerful pc setup. Requires a rather powerful computer setup, in terms of cpu and graphics. We’d like to introduce the Phoenix RC Pro Simulator Version 5.5. Now this is the #3 simulator on the list and for good reason. It allows you practice your flying from the comfort of your own computer. Yes, just like all the other ones. But what’s different about it? Well, this is a totally different sim than Real Flight. In-fact, Runtime Games isn’t nearly as popular as above mentioned company. But with that being said, they still manage to make a pretty good software to get your training down. Unlike all the transmitters which come along, letting you ONLY use them with the simulator, the one included here can be used to fly an aircraft in real life. Alright, let’s dive into this products main features. You need to know what makes It great. *Also, there’s an improved model editing system which lets you complete control each models flight characteristics in detail. This sim lets you upload 3D geometry definitions from almost any program so that you can fly creations of your own, then share online. This means, you create a 3D model, then you can fly it inside the simulator. This isn’t a feature others do, that I know of. Internet/LAN multiplayer mode with voice-chat allows you to fly with other pilots, using the same simulator. Also, you get tutorial videos which are taught by experienced pilots. 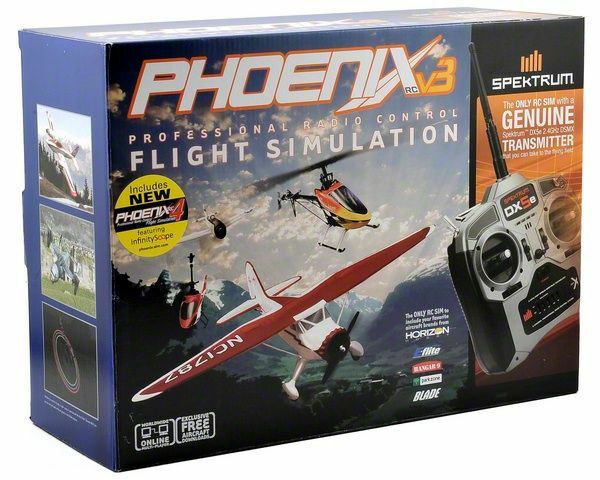 First main feature you’ll notice, right away, is that it comes with not just a simulator transmitter but a one that can be used on an rc aircraft. This sim has the most models to fly, over 200 helis, airplanes, float planes, autogyros, and a few others. In addition, you can fly in first person (FPV) or 3rd person. -Compatible with most Windows platforms, such as 7, 8, and 10. This software is excellent for a beginner. If you don’t have much experience flying a drone to save a lot in the future, this is it. The rather small investment will pay back multiples in the future with your improved experience. Graphics are solid, multiple reviewers have stated that even on their older mid-range laptops, they were able to run the simulator and have exceptional visual and audible experience. There’s more than enough to choose from, both in flying sites and drone variety. Although there’s no residential flying sites as some would like for aerial photography, there’s plenty of others that would be a bit similar. Being a simulator, it does NOT mimic nearly everything a real experience does. Some have reported it being more like playing a video game than a simulator. In addition, the transmitter requires AA batteries (although it’s connected via USB). Covering the top pick above, this one is slightly different. Instead of focusing on all types of flying aircrafts, you’ll only be flying drones. The Great Planes RealFlight Drone Edition is what I’d consider, the ideal simulator to start learning to fly, and save yourself a TON of money from pending crashing events. Made by the same company, it makes sense as to why they would make a separate version, tailored towards only quadcopter flying. Obviously the dynamics are different, so there’s a totally different feel from planes and drones. For the price, you’re not just getting the software, but also the remote control transmitter. Lets dive into its mean features… Graphics are quite good even with medium power graphics and CPU. All of this, is thanks to the RealPhysics 3D and TrueView realistic lighting. This software includes an Interlink Elite USB 8-Channel Transmitter. This means, 99.9% of all drone you fly in the simulator, will feel and function just like real-life ones. Each function mimics what would happen in real-life, in addition to digital trims which let you adjust each function ever so slightly. You can choose from 20 flying sites and 15 different drones, ranging from small to larger aerial photography platforms. When I mention large sized, I mean 6-8 rotor designs. Although there’s quite a few commercial drones that are not available to fly, you’ll find there’s one just like them (in different names), which mimic the exact looks and flying feels. Graphics are quite good even with medium power graphics and CPU. All of this, is thanks to the RealPhysics 3D and TrueView realistic lighting. There’s multiple views you can fly the drones in. Both in 3rd person and 1st person, or mentioned as “Drone’s Eye View”. -Compatible with Windows Vista, 7, 8, and 10. -Minimum system requirements are Intel Pentium 1.0GHz or equivalent. 512 MB RAM or greater, 3 GB of HD Space or more, 3D Accelerated Video with 32 MB of Dedicated Video Space with Full DirectX 9 compliance (Shader model 2.0 or better). -Best results minimum requirements are Dual Core 2.4GHz CPU, 2GB RAM or more, 3D Accelerated Video with 512 MB dedicated video memory or more, and Pixel Shader 3.0 support. The photogenic scenery in this simulator gives you a very real feeling of actually being at the location. In addition, the quality and detail of the planes are impressive as well. There’s a BIG variety of aircrafts to choose from (over 200!). Seriously, you can choose from most kinds of planes you’d be able to buy at the store. More expensive than other simulators, even more than the bigger brands. This one is a classic, in-fact it has been around for over 5 years (writing this part as of 2018). The Great Planes RealFlight G6 with the Megapack Mode 2 is one for the record books in terms of popularity. Let me clarify what that means. This software came out back In 2012 and it managed to generate a lot of fans which stuck to Great Planes brand. This one focusing on airplanes and helicopters, lets you practice for as long as you want, and if something happens… (crash), simply click the reset button. In fact, it’s the only simulator with a reset button, especially during the time it came out. To see what this radio control flight simulator is so great, we will cover the primary features below. A rather pricey simulator brand new, it features the entire software which includes a wide range of aircrafts to choose from. To fly these aircrafts, you’ll get a USB Interlink Controller. This unique transmitter includes a RESET button, giving you the ability to start over and fly again (just like a video game). There’s approximately 120 aircrafts to choose from, primarily airplanes and helicopters. Practicing flying isn’t the only thing you can do, not at all. You can actually do dog fights and play online against other players. Doing a variety of things, reduces the chances that you’ll get bored of the flight sim. You can choose from multiple flying fields. From flat surfaces like an empty grassy park more rugged terrains, giving you a greater challenge in flying. -Compatible with Windows XP, Windows Vista, Windows 7, and Windows 8. -Minimum system requirements are 1.0GHz or greater processor, 512 MB of RAM or greater, 5 GB HD space or more, 32 MB of Dedicated Video memory, DirectX 9 compliance, and DVD Drive. -Ideal system requirements are 2.4GHz or greater, 2 GB of RAM or more, 3D Accelerated Video with 512 MB dedicated video memory, and Pixel Shader 3.0 support. *Note, these are requirements based on 2012. Today, it should be very easy to find computers to have these specs at a bare minimum. The interface and dynamics which give you the ability to fly all the planes are extremely user friendly. Especially with the reset button, you can crash multiple times and just as fast, take-off and try again. Like I mentioned earlier, you get 65 airplanes and 20 helicopters to choose from. In addition to that, you get another 36 more airplane models that add an additional level of variety. Surprisingly, the amount of computer performance required to run this simulator in high quality settings, is rather reasonable. In fact, most mid-level laptops and desktops will have no problems at all. It’s on an older platform, so don’t expect groundbreaking graphics and dynamics. Coming down to the #5 on my list, its the GoolRC RC Flight Sim with a USB powered transmitter. This is really as cheap as it gets. Aside for buying some fidgety iPad application which lets you simulate RC planes using the tablet… this one lets you control 3D crafts from your computer… for less than $40! That is an achievement in itself, but it’s cheap for a reason. You see, this software is for older Windows versions, such as Windows ME, 2000, or XP. Anything more than it won’t work. With that being said, if you have any of those ancient operating systems, this is the way to go. The primary way to use this setup is with an outside simulator, such as Phoenix, Clear View, Real Flight and others. But if on a budget, you can’t go wrong (just don’t have extreme expectations). Let’s dive into the primary features that make this a worthy consideration. Whether you have a DVD drive or not, it won’t matter. You can easily download the software on their official website. Mind you, the software can easily run on low-end computers. If you just use the transmitter, you’ll have the ability to use it on most RealFlight simulators such as G4, G5, G6.5 and others. The budget friendly package, lets you get down the basics of flying. As the models used in the included software are very animated and there’s not much “realism”. With that being said, dynamics are there and you’ll get the feel for it. -Software included is compatible on Windows ME/2000, XP and Vista. -Minimum operating system requirements are: 100% Pentium III or AMD Athlon/64 compatible processor with at least 800Mhz, 128MB of RAM, 1 GB of free hard disk space, CD-ROM drive, Open GL compatible graphics card with at least 64 mb of video space, 100% DirectX compatible sound card. *Talk about old school requirements. There’s nothing better you can get for the money, that will even give you a rough idea of how radio controlled toys fly. If using the included software, required system specs are low and most computers will have no problem getting things started. The wire connected to the transmitter is a bit flimsy, and would risk tearing if not careful. Are there RC Plane Simulators for the MAC? This is an area where simulators for this operating systems are… rather weak. Why companies are not dedicating time and effort to create amazing programs to work on Mac pc’s… is beyond me. However, there is one program that works on Apple Mac to some extent. Aerofly RC7 is the top simulator for Mac computers, and the reason behind it is… because it’s really the only program available. What makes this one unique, is the capability of having both regular, radio controlled, helicopters, drones and more. If you’d like to check it out, you can click here. Read to Buy the Real Thing? If you got enough practice on that phone app you downloaded for free, and in addition, you used a real controller with a beautiful and realistic software, it may be time to buy the real thing. In fact, we have a guide for that. If you want to find the best rc planes to start flying, be sure to check out our page for that. You have have just some basic skills down, but even as a beginner… a real RC plane is about “as real” as it gets when it comes to learning. Looking For Fun RC Plane Games? There’s simulators designed for you to eventually fly the real thing, and there’s rc plane games which are designed just for fun. We have a guide for that. Please don’t mistake this guide for just simple games, go look at the link above to our page specifically about the top programs to download for your phone or computer. There you have it, this is an entire guide I’ve always wanted to put together to help me fellow rc plane enthusiasts to read. I’ve tried using each software, and my personal pick for the best simulator is the Great Planes Real Flight G8. I recommend you don’t waste much time trying to get any of these softwares (other than the last one) to work on a mac computer. Instead, use a high quality Windows operating system and you’ll be satisfied with what you get.